Are you a Leap Day Baby? 2. According to astrologers, people born February 29 under the sign Pisces have unusual talents and personalities reflecting their special status. 3. The odds of being born on a leap day are 1 in 1461. 4. The record for the most generations born on Leap Day is held by the Keogh family in Ireland and Great Britain. The Keogh father, Peter Anthony, was born on Leap Day in 1940 in Ireland, his son, Peter Eric, in 1964 in the UK and the granddaughter, Bethany Wealth, on Leap Day in 1996. If you are a Leap Day Baby born on February 29th Optimal Chiropratic would like to offer you a free consultation with scans worth €75 for the month of February. 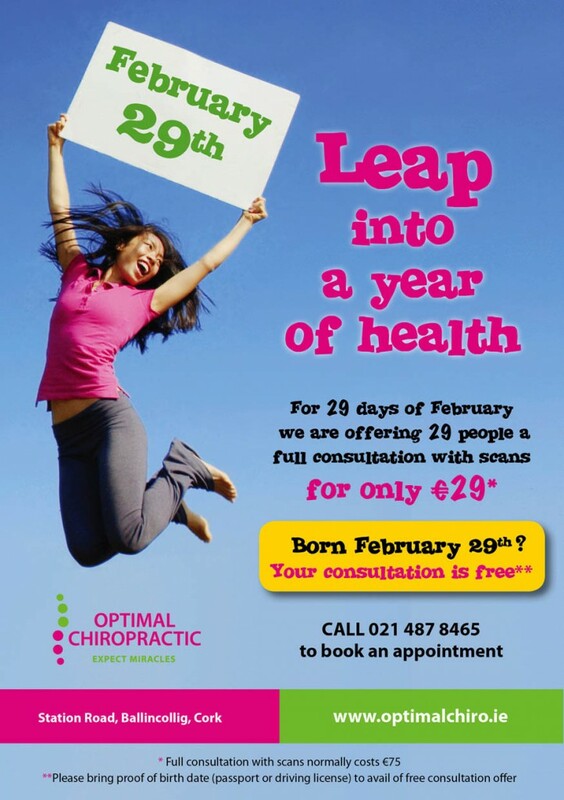 For those of you not lucky enough to be born February 29th; for 29 days of February we are offering 29 people a full consultation with scans for only €29 to celebrate Leap Year – after all it only happens once every 4 years. Call 021 4878465 and Leap to Health with Optimal Chiropractic.